Cò às a tha thu? • Leugh mu na daoine. • ’S e oileanaich a th’ annta. • Tha iad ag ionnsachadh Gàidhlig aig Sabhal Mòr Ostaig. • Sgrìobh am fiosrachadh ann am Beurla. • Tha faclan ùra ann. Read about these people. They are students learning Gaelic at Sabhal Mòr Ostaig. Choose two of them and write their information in English. Look out for any new vocabulary. Hai! Is mise Daarina. Tha mi ochd-deug agus tha mi às an Òlaind. Tha mi ag ionnsachadh Gàidhlig aig Sabhal Mòr Ostaig. Bidh mi an seo airson seachdain. Is toigh leam ceòl Gàidhlig agus tha mi math air seinn. Is urrainn dhomh an fhidheall a chluich cuideachd. Tha Sabhal Mòr Ostaig a’ còrdadh rium. Tha Gàidhlig nas fhasa na Beurla! Hai! Is mise Karl Schulz. Tha mi trithead ’s a h-aon agus tha mi às a’ Ghearmailt. Tha mi a’ fuireach ann an Èirinn. ’S e tidsear a th’ annam agus tha mi ag obair ann an àrd-sgoil. An-dràsta, tha mi ag ionnsachadh Gàidhlig aig Sabhal Mòr Ostaig. Bidh mi an seo airson seachdain. Is toigh leam coiseachd agus marcachd. Tha each agam. ’S e Seumas an t-ainm a th’ air. Is mise Anastasia Karras agus tha mi fichead ‘s a trì bliadhna a dh’aois. Tha mi a’ fuireach ann an Sasainn ach tha mi às a’ Ghrèig. An-dràsta, tha mi ag ionnsachadh Gàidhlig aig Sabhal Mòr Ostaig. Bidh mi an seo airson mìos. Tha e a’ còrdadh rium gu mòr. Ann an Sasainn, bidh mi ag obair ann an ospadal. ’S e nurs a th’ annam. Hallò. Ciamar a tha sibh? ’S e Alasdair MacCoinnich an t-ainm a th’ orm agus tha mi à Alba Nuadh ann an Canada. Tha e brèagha. Tha mi ag ionnsachadh Gàidhlig aig Sabhal Mòr Ostaig an-dràsta. Bidh mi an seo airson cola-deug. Is toigh leam Alba. Tha i uabhasach brèagha agus tha na daoine càirdeil. Is toigh leam ball-coise, èisteachd ri ceòl agus ruith. Romàinia! An Èipheit! Morogo! An Tuirc! 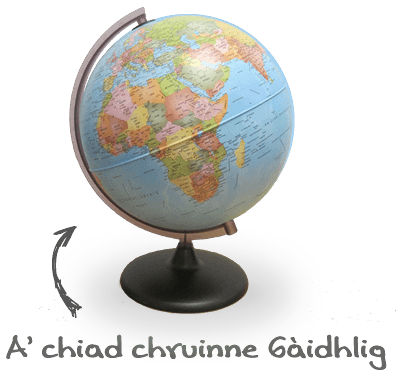 Did you know that our friends at Stòrlann have produced a Gaelic globe? When you are working on this module in class, be sure to use it!